A full length portrait of a youth and a young woman with their arms around each other, another woman standing just behind them. They are described as Jikul which is lineage or clan name not associated with one tribal territory, but which was a significant lineage around Nyueny and surrounding villages in Leek country, but also elsewhere such as Western Jikany. Behind them can be seen various articles of Evans-Pritchard's camp - a camp bed, some rope and open crates, suggesting that these youths were gathered near to his tent, a peg of which can indeed be seen in the left foreground.. Note on print reverse ms pencil - "5 Jikul" & print front border ms ink - "NUER I/64"
Morton, Chris. 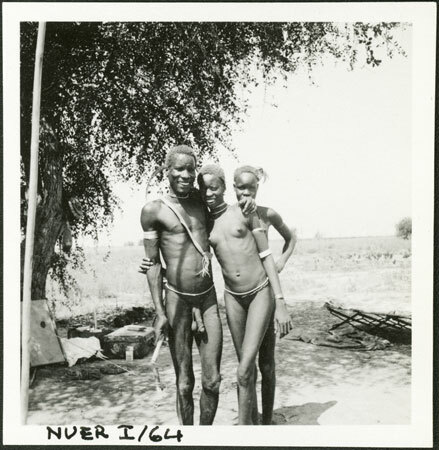 "Nuer courting couple" Southern Sudan Project (in development). 03 Jan. 2006. Pitt Rivers Museum. <http://southernsudan.prm.ox.ac.uk/details/1998.355.32.2/>.